Think like the political pros and your mind will go to the long game instead of the short one. The short game is the elections of 2010. The long game is redistricting in 2011, when maps are drawn that corral the voters into the districts that will elect legislators for the next ten years. The primary elections are just 79 days away, and the general election that'll put the next Legislature, governor, and other state officials in place takes place in less than a year. The political folk in Texas are consumed by those elections. But many of them are thinking ahead to the next Census numbers and to the biggest political job in front of the Legislature in 2011: Drawing new political maps. Think like they think and your mind will go to the long game instead of the short one. The short game is the elections. The long game is maps. This election is the one that picks the people who draw the maps that corral the voters into the political districts that will elect state and federal legislators for the next ten years. At the moment, the Republicans have a distinct advantage in Texas. They could end up in the position the Democrats were in 20 years ago, with the other side eroding their numbers but with enough juice left to draw the political maps. You can argue — or let a Republican argue for you — that the Democrats held onto the Lege and Congress through the 1990s because of the redistricting maps they drew at the beginning of the decade. The state was turning red; a decade that began with no Republicans in executive statewide offices ended with no Democrats in those jobs. But the numbers in the statehouse were much closer: The Republicans entered the century with a one-vote advantage in the Senate, and the Democrats held the House until the 2003 session. That had everything to do with the maps — about 58 percent of the state's voters were picking Republicans for most offices even while they were in districts designed to keep Democrats in control of the legislative branch. In 1990, Democrats whose control over Texas was waning drew maps that kept them in power — in the congressional delegation and in the Legislature — well after it became apparent that all those Democrats were representing a red state. The maps they drew in 2001 were bluer than the Republicans thought was fair, and in 2003, the GOP's cartographers got out their crayons and put together districts that let them elect the first Republican speaker since Reconstruction. These things can be more powerful than voters. Draw them wrong, and your advantage erodes. The congressional maps drawn in Texas in 2003 have held steady; the Democrats haven't been able to chip away at the Republican majority in the delegation. That's true, with a couple of ripples, in the Texas Senate. There are 19 Republicans and 12 Democrats there (the Republicans picked up a seat when Victoria Democrat Ken Armbrister decided to move on and Glenn Hegar took over; the Democrats got it back when Wendy Davis of Fort Worth upset Kim Brimer last year). By comparison, the maps drawn in 2001 elected 15 Democrats and 16 Republicans to the Senate. The House map was drawn to get more seats rather than to hold them. They won 88 seats in 2002 — up from 72 two years and a different map earlier — flipping the majority and electing a Republican House Speaker. Many of those seats turned out to be hard to hold, and the numbers slid perilously close to party parity. At the time, the mappers were confident; now, it's easy to find Republicans who think they'd have held their ground if they'd drawn, say, 82 solid seats instead of reaching for 88 or even 90 and stretching the numbers too thin. The House advantage was 76 to 74 in favor of the Republicans during the session earlier this year. Both parties were sort of skittish about it, too; a bad bounce could have landed the House in either party's hands. But autumn has not been a blue season, at least politically. If nothing else changed, the numbers will likely be 78-72 next session because of Chuck Hopson's party switch and David Farabee's decision not to seek another term. One actually loses the Democrats a seat; the other is a probability, given the way people in Farabee's district vote in races where that solidly established last name is not on the ballot in Wichita Falls. That puts the House a little further out of reach for the Democrats than before, a little safer for the Republicans. It's impossible to know what the election environment will be like in a year, when the elections roll around. But the climate now — while candidates are being recruited — favors the right. The economy is bad. National lawmakers are bickering and dickering over health care reform. And there's war. All of that makes it easier to recruit people to run against Democrats, who are (at least nationally) on the ropes at the moment. The Democrats are stirring, but haven't surfaced a well-financed team that's focused on the prize in a mapping year: The seats on the Legislative Redistricting Board. If the Legislature locks up and can't agree on maps (or, a reader points out, a governor vetoes what they agree upon), that board gets to decide what should happen. And at the moment, everyone on the five-member panel is a Republican: Lt. Gov. David Dewhurst, House Speaker Joe Straus, Attorney General Greg Abbott, Comptroller Susan Combs, and Land Commissioner Jerry Patterson. It's a strong group, politically. Dewhurst is the wealthiest guy in state politics; he'll always have enough money to fend off challengers — he won't get beat for financial reasons. Abbott is both well financed and ambitious; Houston Democrat Barbara Ann Radnofsky, who lost to Kay Bailey Hutchison in 2006, is challenging him. That's an uphill race, both financially and politically. To win the speaker seat, you have to win a majority in the House, and that's where the Farabee-Hopson changes undermine the effort. The House might turn out to be Democratic when the election year is over, but that's not the way to bet. That leaves Patterson and Combs. Some Democrats are circling, but so far, nobody has popped up with the combination of money and charisma (or fame) to make it work. If they can't get the LRB, their last hope will be the courts and the Obama Administration's Justice Department, which has to sign off on the maps under the terms of the Voting Rights Act. Democrats are putting a lot of faith there; redistricting has never been done with a Democratic administration in power (working backwards: George W. Bush in 2001, George H. W. Bush in 1991; Ronald Reagan in 1981; Richard Nixon in 1971). It ultimately goes to court (and the congressional maps could be drawn from scratch there). There's no rule that requires it, but the courts have a tendency to adjust the maps that come to them rather than starting over. If the Republicans control both legislative chambers and all of the LRB seats (and many of the federal courts, if you look), they'll have the tools to preserve their majorities in Austin for the next decade. The most likely bodies to draw the state's maps? The LRB and the federal courts. State legislators don't have overwhelming motivation to work on congressional maps (congressional maps skip the LRB if not resolved by lawmakers, and go straight to the courts). It's too much blood spilled for too little political profit. And the numbers in the Senate argue against passage of legislative maps. The GOP doesn't have two-thirds of the Senate — the number needed to bring up legislation for approval there. 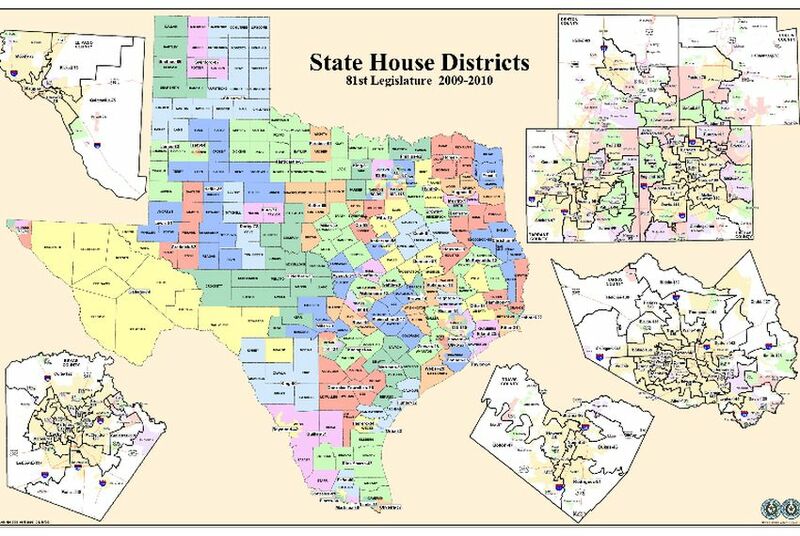 Unless Dewhurst wants to generate a brawl over whether to invoke that rule or not (remember Ardmore and Albuquerque if you think they can hold hands, bake brownies, and work it all out), the Democrats have enough votes to stall redistricting and send it to the LRB. Decisions there would be reviewed by the Obama Justice Department. If history is any guide, the results then will go to a federal court for review, and that's where you'll get the final maps.